Remember Ramires, that quiet, unassuming, indefatigable midfielder you used to see running around in Chelsea’s blue or Brazil’s yellow? Well, he’s in China now, and apparently something—the air, the food, the refereeing—has eroded his sanguine demeanor in just a few short months. I’ve not been able to find any good context to explain what incited the...interaction you see above, but it is fascinating nonetheless. Just after the final whistle of Jiangsu Suning’s disappointing 2-1 defeat at the hands of Shandong Luneng on Saturday, a number of Jiangsu players swarmed the head referee to protest some call or other. When the video up top starts, the ref and Ramires are already being held back by a bunch of Ramires’s teammates and what appear to be Jiangsu training staff members. Right when it looks like things have cooled off, the ref sprints around the barricade of bodies and toward Ramires and shows the player a red card. 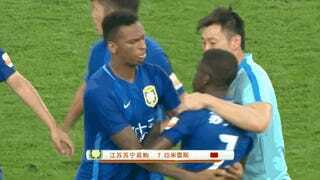 Ramires sees the card and tries to twist himself out of the grip his compatriot, Jô, has locked him into, and two more Jiangsu guys aid Jô in holding the angry midfielder back. Ramires hits his captors with the old “Guys, guys, it’s cool, I’m calm now, let me go and I’ll prove it,” which gets the group to slacken their hold. Ramires spots his moment. He ducks under one guy’s arm and tries making a dead sprint for the ref, only one of his eluded captors grabs a handful of the back of his jersey to slow him down. Eventually another Jiangsu player comes in to obstruct what almost certainly would’ve been Ramires’s blood-soaked path, and the phalanx of bodies that has formed around the ref withstands the Brazilian’s charge. Realizing he would not taste the blood he so visibly craved with this attack, Ramires is then led away. Remember this video, Graziano, and remember that with more money comes more problems.